It doesn’t matter if you are planning a shorter or a longer trip to Bali, the Nusa islands shouldn’t be skipped. There are three islands in total, Nusa Penida, Nusa Lembongan and Nusa Ceningan. Even though Nusa Penida is the more popular one, a lot of people choose to stay in Nusa Lembongan. 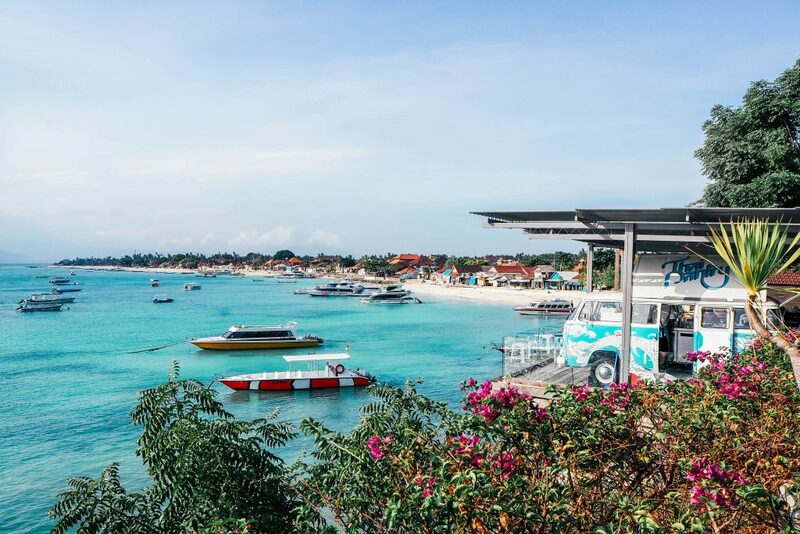 There are more resorts, restaurants, and hotels in Nusa Lembongan so that is one of the main reasons why people choose to base themselves on Lembongan. I did the same thing. 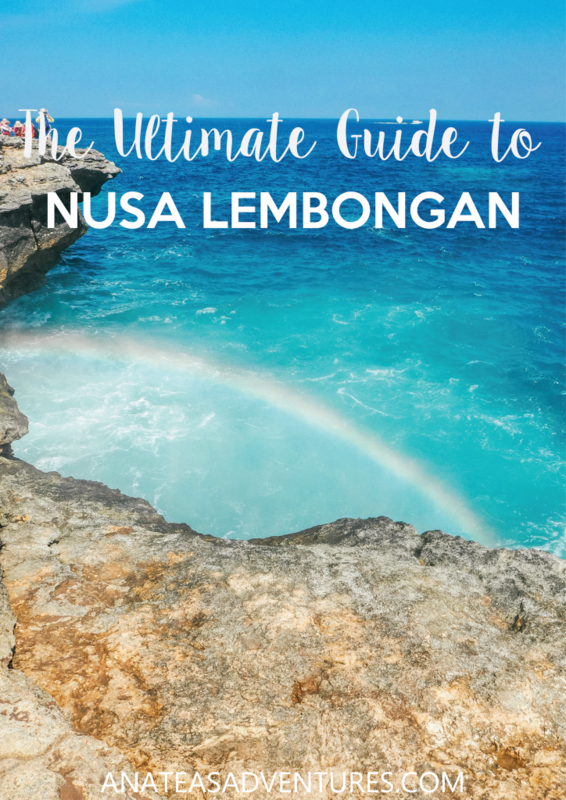 I based myself in Nusa Lembongan and from there I easily explored all three islands. To go to Nusa Lembongan, the easiest way is to just get a high-speed boat. Whenever I travel around Indonesia by boat, I always use Eka Jaya Fast boats. They have pretty big boats compared to others so there is always enough space for everyone and it doesn’t get too crowded. The fast boats to Nusa Lembongan leave from Sanur, so if you have a cheap way of getting to Sanur I would recommend just going there directly and trying to haggle the price down. If not, just go to any of the agencies and try to get a ticket. Free shuttles to Sanur, and to your hotel in Nusa Lembongan is usually included in the price. The usual price for this trip would be around Rp300k (18€), but if you’re good at haggling, you can get it down to Rp250k (15€), which is what I paid one way. 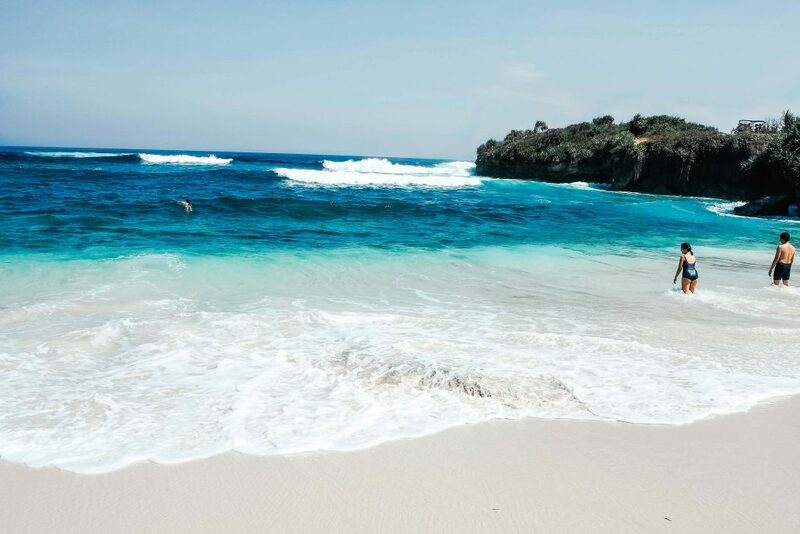 Nusa Lembongan is considerably smaller than the popular Nusa Penida. You would still need a motorbike if you want to explore the island fully. If however, you do not feel comfortable driving, you could always walk to places. For most places, it would take you 20-30 minutes to walk if you are staying somewhere central. Or another option is getting the local shuttles but every drive would cost you about Rp100k (6€). A good thing to know though is if you call in and make a reservation for dinner, they would usually provide a free shuttle to take you to and from your hotel. An island with a lot of gorgeous beaches with perfect white sand and blue water definitely has a lot more to offer. 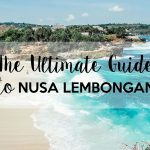 Here are all the things you can do in Nusa Lembongan. This is definitely one of my favorite beaches in Indonesia. Getting there could get a little bumpy, but nothing too bad. The first thing you notice is the Dream Beach swing and behind it in the background, you can see the beach. Immediately, you are welcomed with the perfect shades of blue that take your breath away. Swimming on the beach is quite hard as the waves are too big, but you can still get into the water and have some fun. Just be careful. 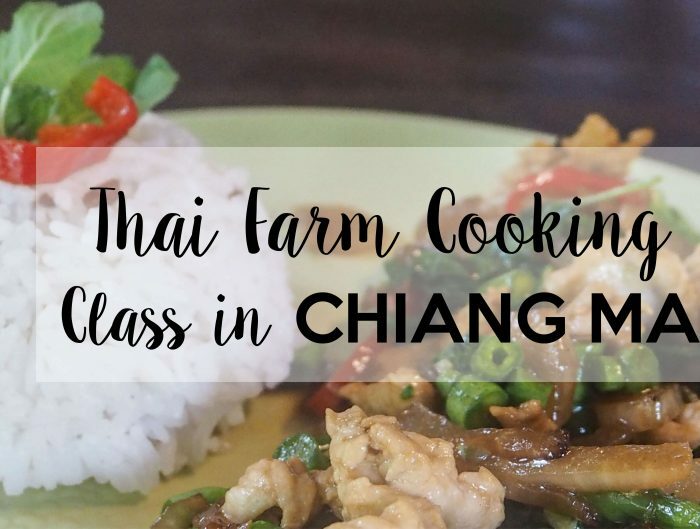 If you get hungry, there are a couple of restaurants where you can eat. My favorite would be Dream Beach Resort because they have a gorgeous pool overlooking the beach that you can use if you are a customer and delicious food. 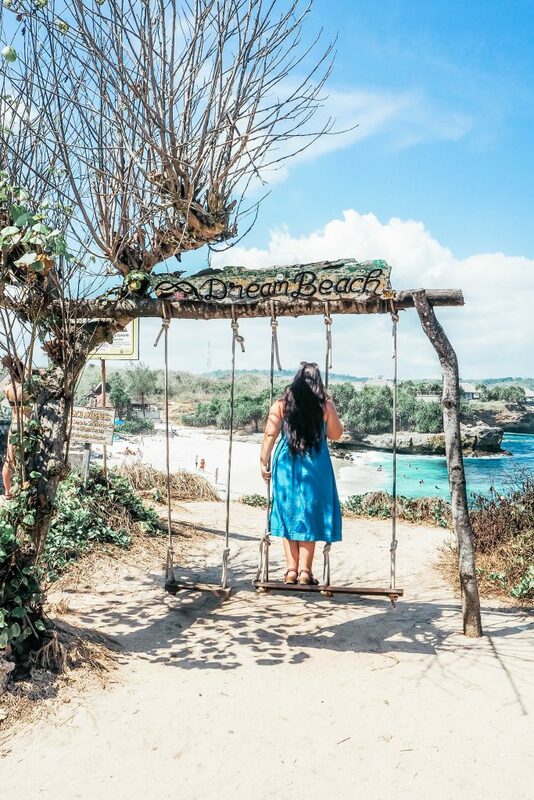 This is probably one of the most popular things to do on the island and the reason most of the people come to Nusa Lembongan. If you are not an experienced diver, don’t worry. Neither am I. You can just go snorkeling, and still be able to see the manta rays perfectly as they swim quite close to the surface. The prices vary, but you shouldn’t be paying more than Rp200k (12€). That’s what it costed in my hostel, but if you go down to The Deck or Yellow Bridge I found a local guy who was asking for Rp150k (9€). Definitely don’t book it online as it costs a lot more money. 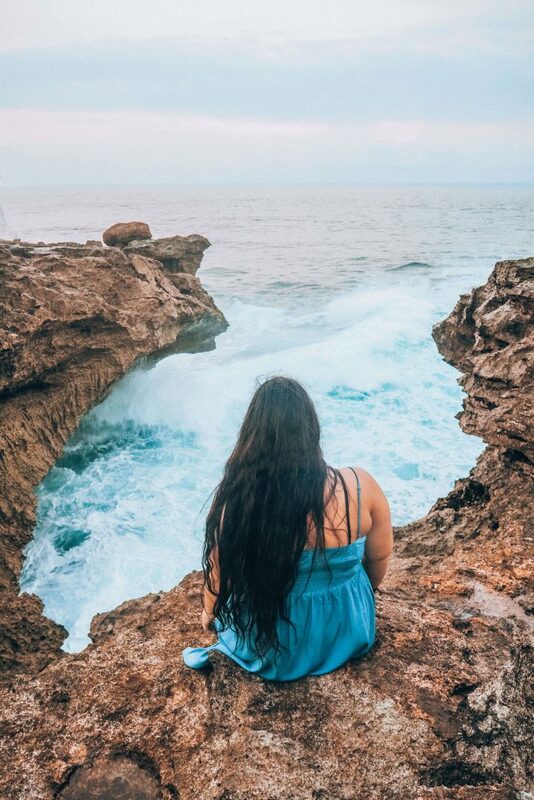 If you are one of those people though, who like to have everything prepared before they go on the trip, this is a good place to book as they do day trips from Bali as well. Everybody usually follows the same route, so you would visit the Manta Bay, the Crystal Bay & the Mangroves. Expect it to be quite busy, but if you have a good guide, maybe you can ask him to try and find a bit quieter space. Getting to Devil’s Tears is just a short walk from the Dream Beach. Personally, this was one of my favorite spots in Nusa Lembongan. Though, to fully experience it, I would avoid going there midday as it gets really crowded with all the tours. Consider going either early in the morning or for the sunset. 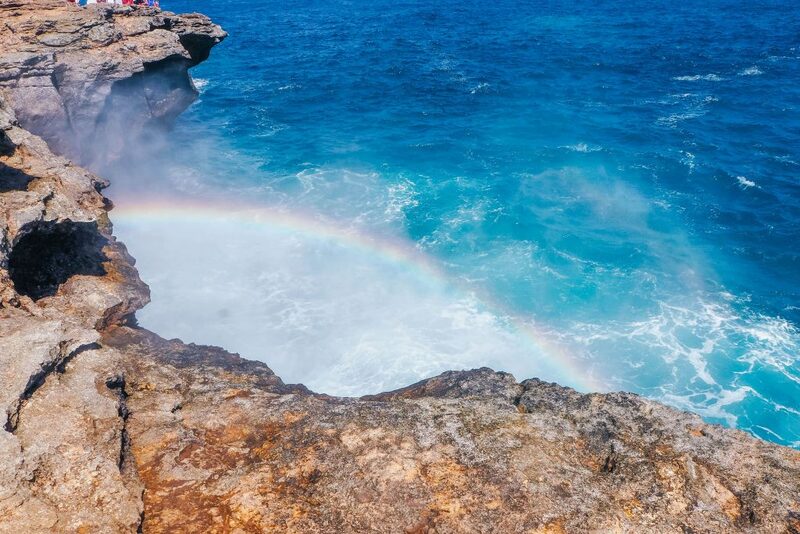 Devil’s Tears is full of beautiful points where you can watch the waves crash into the rocky shore. Sometimes you can even see a rainbow appear. Although, not as nice as the Dream Beach, Mushroom Bay was still really nice. It is definitely much more suitable for swimming as there are no waves there. It had a much more relaxed vibe and you could see a few families with their kids. Be sure to grab a bite somewhere around the Mushroom Bay as there are a lot of good restaurants on the way. Going to explore the Mangrove forest is quite easy and not that expansive. The boat cost us Rp100k (6€ – not per person price) and it took us about 30 minutes to drive along the river and see the forest. This is a perfect place to watch the sunset and have a dinner. If you go right, you have a really long beach, full of boats and on the sides, you can find a lot of travel agencies. If you go left, you will be welcomed with a lot of restaurants, resorts, and spots to watch the sunset. One of my favorite places was Thai Pantry. 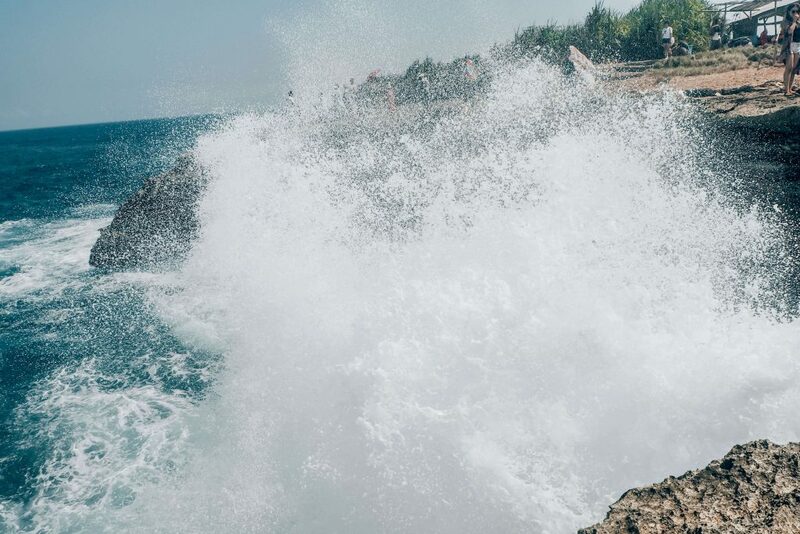 There are some spots in Nusa Lembongan where you can jump from the cliffs like The Dream Beach or Devil’s Tears. I would definitely recommend having a local show you where exactly are the good and safe spots to jump as it can be quite rocky and shallow. Lembongan Hostel (Hostelworld) – This is where I stayed, and I personally thought it was really good. It had a really nice pool and spacious and clean rooms. The showers had no hot water and the breakfast wasn’t anything special, but other than that it was really good. Especially for solo travelers, it was always social and it was easy to find people to explore the islands with. Pondok Wisata Widi Inn (Booking.com) – It is located near Jungut Batu beach, so that would be great for couples who want a little private time and avoid the hostels. Even though they don’t have a pool, the beach is only a few minutes away. Sanghyang Bay Villas (Booking.com) – It is a resort with a nice pool area and little huts. It is located right next to the Mushroom Bay which is also a great area with a lot of restaurants around. Lembongan Seaview Hotel (Booking.com) – The hotel is located near the Dream beach and has a gorgeous little infinity pool which definitely makes it a good choice considering the price. 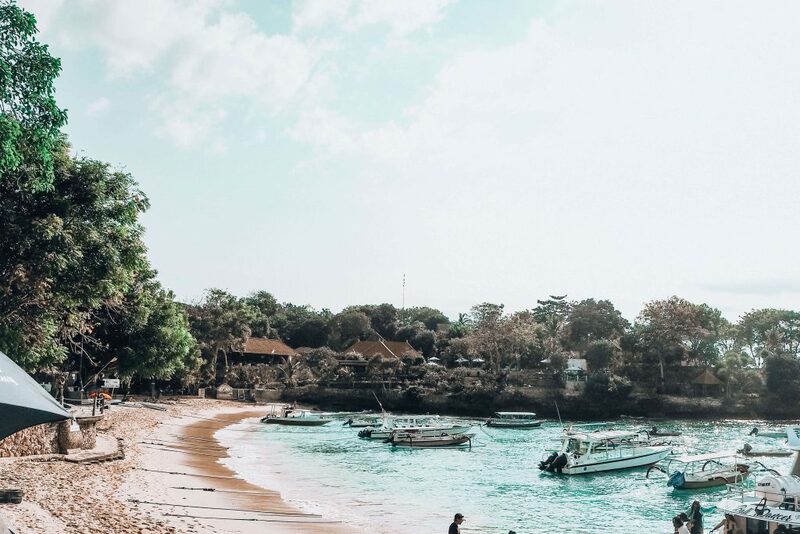 Lembongan Beach Club & Resort (Booking.com) – The 5-star hotel is located on the Jungut Batu beach, giving their customers a full luxury experience. The Tamarind Resort (Booking.com) – A gorgeous 5-star resort that is also located near the Jungut Batu beach just screams luxury with its amazing pool and a bar. Anatea is a free spirit who can never stay too long in the same place. Always traveling around the globe.